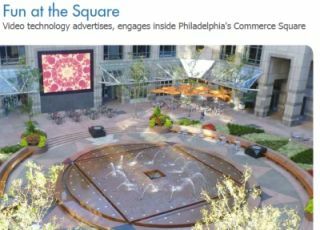 Philadelphia's Commerce Square, a 1-acre, open-air courtyard with cascading fountains and dining areas, recently installed a new, dynamic Daktronics outdoor LED video display. Owned and developed by Thomas Properties Group Inc., Commerce Square, a two-tower office and retail complex, occupies an entire city block in Philadelphia's downtown district. The new video board measures approximately 16 feet high by 22 feet wide, features 10-millimeter pixel spacing and was designed and manufactured by Daktronics Inc.
"The Daktronics video display has exceeded all our expectations in terms of its image quality and reliability," said Randall L. Scott, executive vice president of Thomas Properties Group. "It has opened a door to a world of opportunities for entertaining and informing guests and tenants at Commerce Square." The display is located above the seating area inside Commerce Square's Central Plaza and regularly broadcasts live television feeds and up-to-the-minute news and information. Decker Construction, a commercial contracting company completing work in the Pennsylvania, New Jersey and Maryland areas, installed the new display, which can easily be seen above Commerce Square's trademark fountains in any direction.